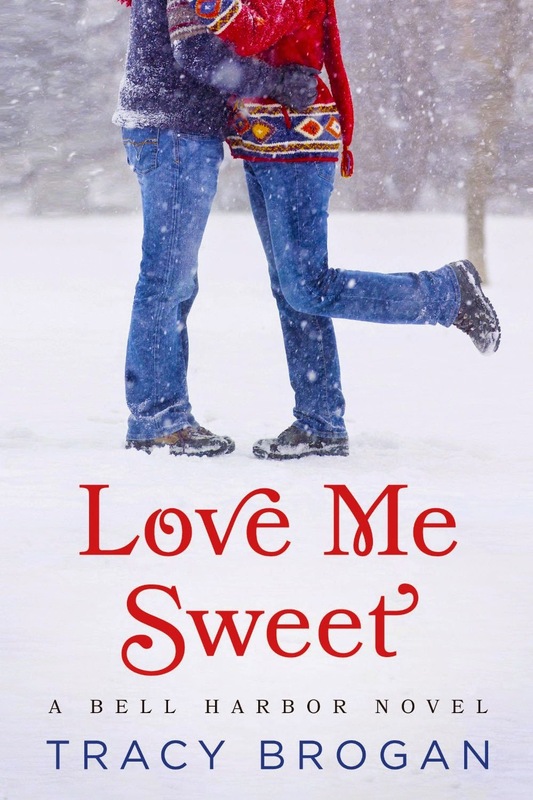 I'm delighted to welcome Tracy Brogan back to the blog today for a Q&A in celebration of her new book, Love Me Sweet, a story that had me grinning from beginning to end. Tracy writes fun and breezy modern stories about ordinary people finding extraordinary love, and also lush historical romance full of political intrigue, damsels causing distress, and the occasional man in a kilt. 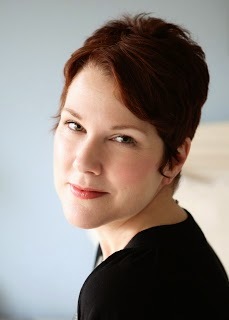 She's a best-selling author in both contemporary and historical romance, as well as a Romance Writers of America (RWA) RITA® finalist in the Best First Book category for her debut novel, CRAZY LITTLE THING. She is also a two-time RWA Golden Heart® finalist. You can find more information about Tracy and her books at her website as well as links to connect with her online. Hi Tracy! Welcome back to the Romance Dish. I just finished reading Love Me Sweet and once again you’ve made me laugh out loud, shed a few tears and sigh with deep satisfaction. Please tell our readers what they can expect from Delaney and Grant and their rocky road to love. I’m happy to be here, Romance Dish! And thrilled to know that LOVE ME SWEET made you laugh, cry, and sigh. The trifecta! In this story, Delaney Masterson is a (reluctant) reality TV star on the run from scandal and Grant Connelly is Bell Harbor’s wandering son. He’s spent the last several years as an adventure show cameraman, but thanks to a series of unforeseen circumstances, he and Delaney end up on a road trip full of bad weather, honky-tonk musicians, and a few Elvis impersonators. She’s got a secret, and he’s got a chip on his shoulder, but still they can’t help getting all shook up and, of course, falling in love. Music has a strong role in this book. I especially enjoyed the scenes on the Paradise Brothers’ tour bus and with the band in Memphis. Do you write to music or do you require silence? If you’re a musical writer, what songs/artists provided the soundtrack for Love Me Sweet? When I first started drafting this book, I took a trip to Memphis with my best friend from high school. 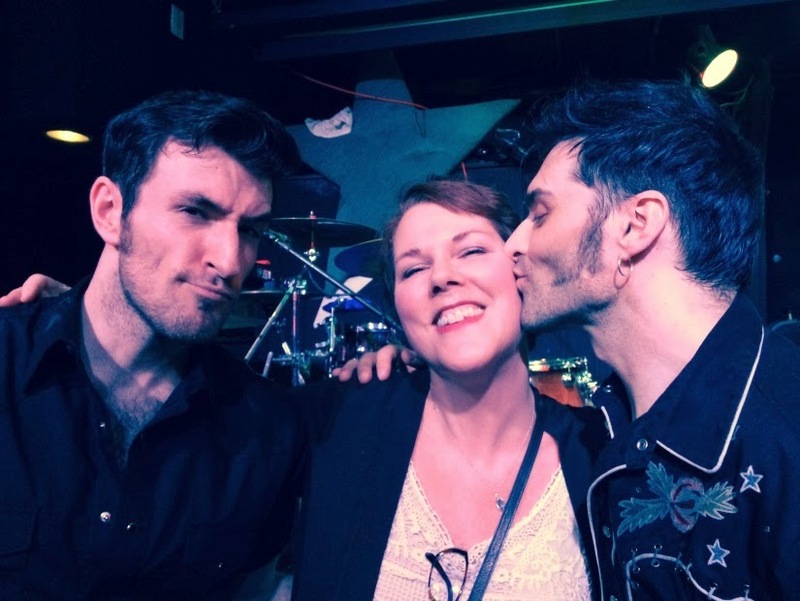 We stayed at the Heartbreak Hotel, visited Graceland and enjoyed all its cheesy goodness, and went to a bar called the Blues City Café where we saw The Eskimo Brothers. They were adorably enthusiastic singers, not too hard to look at, and their lyrics were blushingly naughty. So during break I chatted them up and said, “I’m a romance writer and you’ve given me an idea for my next book.” I bet they thought I was kidding but I wasn’t! But when I’m writing, I don’t listen to music. I need absolute silence – which is very inconvenient for me because my house is as quiet as a school cafeteria. Grant pulled her to the dance floor and into his arms. The song was something sad, a story of love gone wrong, but nothing about this felt wrong. Everything about this was just right. The truth was, he’d never felt this way before. This was different. He wasn’t naive, of course. He understood she was shiny and bright, and everything about them had that new car smell, but he couldn’t imagine ever growing tired of her. He’d never grow tired of her lips because they tasted like caramel and set his skin on fire. He wouldn’t grow tired of her laugh and the way it burst like a firecracker. And he’d certainly never get tired of the way her body moved like water under his palm. Nope. Never getting tired of that, either. Grant pulled her closer, nuzzling the curve of her neck. He could spend the rest of his life there, breathing in the scent of that sweet spot. Lane was beauty and heartbreak and everything in between and he had to kiss her. Right now. In the center of a crowded dance floor, he had to kiss her. So he did. She kissed him back, and he knew this night would be even better than the one before. And it needed to start right now. Delaney is surprised to discover the talent of one of the band members that inspires a baby hat making competition. What talent do you have that readers would be surprised to discover? Sadly most of my talents are so well hidden I have yet to find them. But I will admit that whenever we play Band Hero, I crush the competition with my rendition of LOVE IS A BATTLEFIELD. My family tried to get me to sing it at a hotel’s karaoke bar not too long ago but I didn’t want to make the other caterwaulers feel bad. I can also make all the people in my house quiver with fear when I give them The Look. Love Me Sweet opens with Delaney on the run from her family’s reality television show. If you could be a contestant/cast member on any real-life reality show, which one would you choose and why? Oh, Survivor, for sure. And I’d be the first one voted off the island because I’d complain about the bugs, I’m no good at puzzles, I can’t go more than a few hours without brushing my teeth. And let’s just say wow, thirty-nine days of me without my tweezers? That would be bad. Very, very bad. I recommend your books to people who enjoy Kristan Higgins. What author would you recommend to readers who enjoy reading your stories? That’s so funny! I’m constantly recommending Higgins’ books, too. In fact, I once got a letter from a very sweet woman who said one of my books looked interesting to her but she wondered if it might be too racy. I told her my books weren’t racy by today’s standards but that, just to be on the safe side, she should go read Kristan instead! I also love to recommend Kim Law’s Sugar Springs series, anything by Marina Adair, and of course there are the masters, Susan Elizabeth Phillips and Jennifer Crusie. What are your plans for 2015? Will you be attending any conferences/booksignings where readers will have the opportunity to meet you? I had to dial back my conference attendance this year but I will be in NYC in July for the Romance Writers of America® National Conference. And I’ve been invited to visit my publisher’s headquarters in Seattle in March. Very excited about that. I recently learned that my books have sold over one million copies. Apparently that earns you a free trip! I’m currently finishing up a Christmas novella called JINGLE BELL HARBOR that I’m so excited about. It’s very light and fun. I probably could have called it Crazy Little Christmas! After that, I’m switching gears and finishing a World War 2 love story that I’ve been wanting to write for ages. Then it’s back to the romantic comedies because I just signed a new five-book deal with my publisher. So that should keep me out of trouble for a bit. Thanks so much for visiting with us, Tracy. Would you like to ask our readers a question? I have been on road trips with my sisters. It would have been impossible not to have adventures & a laugh. Never say "dare". Always up for the challenge. Do you drag out the stories and relive the adventures at family gatherings, Mary? My brothers and I still laugh over road trip adventures from when we were kids. I find that my memories of road trips vary drastically from how my sisters remember them! We rented an RV when our kids were little to go to Chincoteague Virginia. It was rainy and cold so we were cooped up together with only one day on the beach. Then on the way home my husband had to drive this huge vehicle in torrential downpours. Yikes! Bad enough driving a car in the rain! I hope you at least have a few good memories from the trip, even with the rain! That does not sound fun!! :( I guess it's nice you weren't in a tent, but still! No fun! What a great interview! I am not entering the competition because I already have all the books AND a tote bag, but I just want to say that Tracy's funny contemporaries are very funny and sweet and well worth a try. The worst trip I can remember is when we were travelling from France to England to visit my family, with three children under 12. It was very windy, the ferry was cancelled, so we ended up in a hotel. On the way we realised that we had a slow puncture in one of the tires, and as it was a national holiday, we couldn't find a garage open to get it repaired. My husband dropped his professional telephone and had to put it back together again, then my mother phoned and said that a tree had fallen on the neighbour's house at 2 am, so none of them had slept at all after that, and could I go to my brother's instead? I *think* that is the worst journey I can remember. I certainly thinks that qualifies as a really lousy trip!!! I loved this book. It became a salvation of sorts for I read it one night while in hospice with my Dad. Sometimes books are truly escape mechanisms. This one did that for me. I was able to go away in my mind to Tracy's Bell Harbor. AND I loved the characters so much. Thank you Tracy! as far as a real trip. I would have to say all our family trips to Nana's and Grandpa's in Florida, One trip was funnier or crazier than the next. 4 of us in a van or car with two dogs...10 hours...and lots of car games and coloring books...Good memories!!! That's a sweet memory, Hope. Thanks for sharing. And thanks so much for doing me the honor of helping to distract you for a bit during a very sad time. Big hugs to you. Worst road trip, 2 years ago , we were heading to Warm Springs, Virginia for my son and his fiance's wedding scheduled for the Friday night before Memorial Day. It was a small wedding with only the couple and parents in attendance. On our way there from SE Florida our car broke down at 7pm about 3 hours from the wedding site. We waited over an hour on the side of the road. Finally a tow truck came and deposited our van at a car repair place then we couldn't find a room as several hundred bikers were on a road trip headed to Washington DC. Luckily , the tow truck driver had some connections and by 10 pm we had the last room in town. The next day we walked to a car rental place and rented a car. However it was Memorial Day weekend, we needed to attend the wedding then drive the 3 hours back by Saturday noon so we could drop off the rental car and get to the repair place before they closed or we'd be stuck in Wythesville until Tuesday morning. Talk about stressful! We made it with 5 minutes to spare. Nerve racking! Yikes! Weddings are stressful enough without adding all the rest. I hope you're all able to laugh about it now. Worst was 2 years ago, visiting our son in Colorado, with husband, daughter, son in law and our granddaughter, then 4. We flew into Denver and our connecting flt to Col Springs was cancelled - all flts cancelled due to weather. It was nite time and we had to try to rent a car, which we did and drive in the dark and rain one to 2 hrs to get to Springs. (It was a long day, waiting in the airport for several hrs to get the connecting flt and over an hour on the plane before they cancelled all flts). While we waiting in airport our granddaughter had fun on the moving people walker. Those people walkers are a great diversion! There is nothing quite like traveling with kids!! I was once stuck in a plane on the tarmac for 8 and a half hours due to a blizzard. It was hellish but at least I was alone and didn't have my toddlers with me! the Colorado Springs story. Sorry. A number of years ago I took a trip with my parents to Ireland. On our last night we were going to stay in Belfast, after a 6 hr drive from my dad's home in Donegal, we arrive in Belfast and could not find the street where we were going to spend the night with friends of friends. The argument between my parents nearly drove me crazy. At one point when we stopped to ask for directions, they both got out of the car, I put my face into my jacket and started to scream to let out some of the tension before they got back in the car. When we flew out the next morning, they could not put us all in the same row.. I said good, give me a seat somewhere else.. I was fine by the time we got home.. But never again..
Glad you enjoyed it, Bube! A road trip that I will never forget since it was unforgettable in many ways took me out of my comfort zone and was unique. Not that far but winding, mountain road that was treacherous and vertigo involved so that was rather uncomfortable. Way out of your comfort zone, I would guess! I try to avoid road trips since they are too tiring too long and difficult but one that was a real winner was way back when I was much younger and we were driving through the Canadian Rockies, scary and awesome at the same time, the views and the beauty. I felt the same way driving through the U.S. Rockies. I was eleven. my road trip with my parents was the worst. Worst road trip ever was coming back from a ski trip and my 10 y/o son had gotten sick while we were away. We had to travel 500 miles with a child running fever, throwing up and having diarrhea. We stopped so many times along the side of the road for him. It was AWFUL! Ohhhhh, that's awful!! Poor kid and poor you!!! My family and I did a 12 hour tour bus trip from Edinburgh to Inverness when we were in Scotland. There was supposed to be a bathroom on the bus but there was not. And some little kid threw up within the first 45 minutes. That was a long, ugly day!!! Oh dear. Not fun experiences for either of you! My road trips are with my family...some with just my girls and I and some where the hubby comes along. Sometimes my girl's will say when daddy comes it's no fun because we have to turn down the radio and not make so much noise, but when we go with you mommy it's fun because you like to dance and sign in the car. When he comes along with us he makes me laugh, he always says stop reading, get your heads out of the electronic and look around at our beautiful world. Then someone will get in the passing lane and hold him up and then he'll start talking about how people should drive. I love him so much but I can't help to guess exactly what is about to come out of his mouth when he is driving...I start laughing every time. Laughing is good! My dad was always the fun one on trips. Mom was a nervous driver/passenger but dad kept us entertained with songs, jokes and plenty of laughter. Worst road trip - my soon to be husband and I were in rural Georgia and he insisted that a business highway was the same as a regular highway. It was in August in a non-air conditioned vehicle in pre-internet days relying on a map. It ended up being about 6 hours out of our way and if we can survive that trip, we can survive anything. I had burns on my legs from the vinyl seats of his truck. Oops! I've mistakenly ended up on a couple of those business routes in rural Georgia. I feel your pain! Worst road trip memory? I have two but the one when my daughter who was 2 at the time puked all over me. We were in the mountains of PA and lucky to get out just before avalanches kept motorists stranded over night. It was also my 30th birthday and I was pregnant. I love your books Tracy. keep calm and write on!!! Oh, not fun at all! My puking road trip experience was with a carsick puppy. Thankfully, I was neither pregnant nor in the path of an impending avalanche! I remember one vacation years and years ago when I was a child. All six of us traveled in one car. I remember being small enough that I could curl up on the floor of the back seat to sleep! We had a convertible when we were kids. I remember my youngest brother at the time sleeping in the well behind the back seat where the top went when lowered and another one sleeping the floor. This was, of course, in the pre-seat belt days. Worse trip was when my mom, sister and I were going to an all inclusive in the Bahamas. I had flown in the night before to Florida, not knowing that I needed a passport. Needless to say never made it to the Bahamas. Stayed three nights in northern Florida instead. Still had a nice time but not the same. Oh, no! How disappointing for you! My dad was career Navy and we made many road trips PCSing over the years. I am one of four children. We had a very strange colored Plymouth station wagon for most of my younger years. Our beloved mutt, Troubles, always got the center seat, right in front of the small air conditioner that my father added to the car. So many memories, most of which are very sweet in retrospect. One early morning, we had pulled to the side of a mountain road so my amazing mom could fix us breakfast on the small propane stove we carried with us. While she was scrambling eggs, frying bacon and brewing coffee, we kids and the dog explored the cold and the remnants of snow remaining. When it came time to leave, Troubles was not to be found. We whistled and searched, calling and pleading for her to return. My dad was typical, in that he wanted to get back in the car and conquer those miles. He finally laid down the law and made us get in the car to leave. He sat there in the driver's seat, listening to us wailing and weeping. Finally he sighed, said a bad word and told us to get out of the car and find that ------ dog. We tumbled out and resumed our search. Troubles finally came sauntering back to our hugs and cries of joy. What could have been a sad and tragic memory is a wonderful one of parents who cared and understood. My heart clenched reading this. I'm so glad Troubles found his way back to you. Sounds like he was aptly named! When I was a teenager my parents decided to take my two brothers and myself to D.C. On our way to D.C. I had a teddy bear in my lap from a then boyfriend. My dad would hold it up face first in the window and make it dance...not so bad right. Well as soon as the people in the car next to us would smile he would flip it around and bend it over to make it "moon" people. As a teenager I found this mortifying. Now looking back I find it hilarious. Especially since every car he did it to laughed really hard. He brought some laughs to some unsuspecting people that day! LOL! This is exactly the type of thing my dad would have done. Like you, I was mortified by many of his antics but today they are precious memories. I am grateful that I have no road trip memories from hell. Most of mine have been uneventful and enjoyable because we always seemed to find a new place to stop and check out on our way. It wasn't exactly a road trip, because we travelled via plane. But the first time I took a European trip with my globe-trotting husband, we had so many things go wrong! It hindsight, it's laughable. Our very full plane from Houston was delayed on the tarmac for two hours due to bad weather, unusual for Houston. Our plane from NY left without us. Our plan to Edinburgh left without our luggage. We had a host of things to cancel and reorganize, due to our late (and sans luggage) arrival. Every step of the way, Hubby (who travelled extensively for work) kept saying, "This never happens!" LOL.... my first serious boyfriend and I had to go to Texas for a wedding of a mutual friend. We decided to make the 18 drive in one fell swoop. I took the first "shift" which was at 4 am. I don't drive well in the dark to begin with and it was raining so I was very, very tense. I ended up taking the wrong interstate and when my bf woke up 3 hours late, he freaked out b/c we weren't in the right state for our route. We pulled over and got out a map and turns out, I took a better route! We ended up there faster :) Thanks for sharing! Hmm - mine would probably be when my father took 7 of my brothers and sisters - and me - on a road trip - to Alaska! My mom was pregnant with my youngest brother so she didn't go along. We drove 11000 miles and traveled all over Alaska for three months - my father was an adventurer! Loved our trips - if only I could do all over again! Your dad - by himself - took eight children on a three month driving trip through Alaska. Your dad is my hero. Ohh wow!!! I'm impressed with your dad!! Alaska is amazing! In the 1960's, my family would go camping. Two tents with ground cloths, a cook fly tarp, 2 cook boxes with all equipment and propane stove, folding chairs, sleeping bags, air mattresses, old style beer boxes [for those returnable bottles - remember those?] - those were painted for each family member, rain gear, emergency box [first aid kit]. It was my mom & dad and us three girls. My dad [as USN WWII veteran & Boy Scout] supervised us. So there was the night we stopped just for 1 night; in thirty minutes we had unpacked the car, started setting up camp, had the tents up, filling the air mattresses, Mom was cooking dinner and Dad was in his chair supervising with a mixed drink in his hand. The man walked over from another camp site and asked, "Can I borrow your girls tomorrow morning ? With my popup trailer camper and my two boys, I can't get on the road before 10:30 am. During my senior year of high school, the teen center that I belonged to took a bus trip to a leadership conference outside of Orlando. There were around 30 high school students, our 2 directors and maybe 5 or so other adult volunteers chaperons. On the way down, we visited South of the Border (border of North & South Carolina), where the guys all bought fireworks, which at the time were illegal to buy in CT where we are from. We had a great time at the conference and all the time we spent at the beach (we stayed in Daytona). On the way home, we stopped in DC in the middle of the night and toured all the monuments (perfect time to see the sights). It was an amazing trip! Best road trip was driving around southern England with my sister-in-law, niece & nephew. Great learning experience for the kids and their first trip overseas. Getting off the highways was the best - like finding a farm in Devon that did Cream Teas - Yum! Then we actually saw Merlin at Tintagel (they were filming a tv show). And we loved the stop at Warwick Castle - then on to Oxford. From there took the train into London for a few days. Oh, that sounds like so much fun! England is one of the countries on my bucket list. Now that sounds like a memorable trip! One of the funniest moments on a trip happened many years ago. Our daughters were about 2 & 3 or 3 & 4. We had stopped at a country farm store and gift shop. In the parking lot, they had a large plastic horse, anatomically correct in its attributes. The horse was big enough for the girls to walk under it. Our oldest pointed and asked, very loudly, "Daddy, what is that?" while pointing to the male part of the anatomy. My husband was totally flustered and couldn't get an answer out. Two elderly ladies standing nearby were having a hard time containing their smiles and trying not to laugh. I finally said, "It is where the horse goes potty." and that was the end of it, they took off to explore other areas. We have to learn to not over think questions and keep it simple.